Key Points That Could Save Your Life! Can Aspirin Help Prevent Heart Attack, Stroke? Could Lowering Current Blood Pressure Target Save Lives? Begun over 5,000 years ago in India, yoga is practiced to harmonize the mind and breath through various breathing techniques, postures and meditation. While it may appear to be mostly comprised of sitting, standing and relaxing, a new study published in the European Journal of Preventative Cardiology says yoga may provide the same cardiovascular benefits as traditional aerobic exercises. Researchers from the United States and the Netherlands reviewed 37 clinical trials with 2,768 subjects. The trials covered various types of yoga, frequency of classes and people involved. 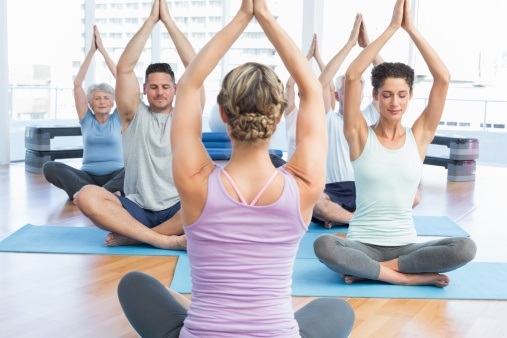 The study included people ranging from younger adults doing aerial yoga to older adults with heart risk factors doing basic yoga. Results showed significant improvements in blood pressure, cholesterol, and weight – all of which are considered risk factors for cardiovascular disease – for all those continually doing yoga compared to those who were not. With such results, researchers are led to believe that yoga can provide the same benefits in risk factor reduction as traditional cardiovascular exercises like jogging, brisk walking or biking. Going back to the root of the practice, the initial purpose of yoga was to develop oneself spiritually. Researchers note that the positive effects of yoga as a physical practice could potentially be due to its impact on stress reduction and relaxation. According to the American Heart Association, constant high levels of stress may lead to heart disease by causing blood pressure and heart rate to rise. Do you know your risk for heart disease? Take our heart risk assessment here. If you are at high risk, see one of Advocate Heart Institute’s cardiologists within 24 hours.